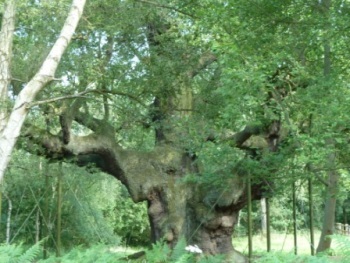 In Sherwood Forest, we saw the Major Oak - a tree with a 33 ft. waistline that is over 1,150 years old! This tree was alive and well when Robert Hode aka Robin Hood escaped the sheriff of nearby Nottingham and King Richard I led the Crusaders. York, England has a well-preserved medieval city center, a beautiful Minster (church) and relaxing river walk. 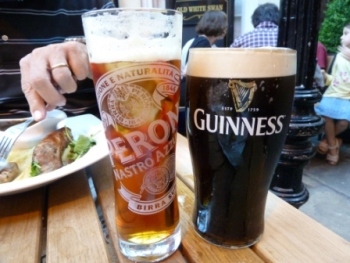 But our favorite treat was eating "fish & chips and bangers & mash" at the Old White Swan Pub along with a pint of Guinness and a Pimm's long drink. 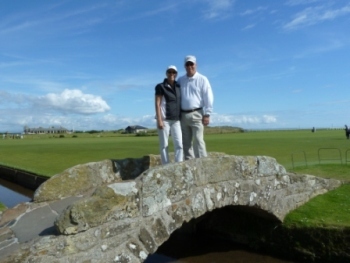 Nothing says "Scotland" like golf - and here at the Old Course at St. Andrews, we stood on the 18th hole's historic stone bridge. 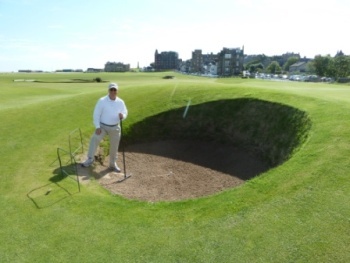 Yes, the bunkers are as deep as they look on TV. 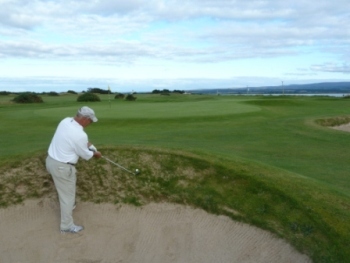 . .
and the fairways, bunkers, seascapes and roughs are so perfectly manicured at the Castle Course; we felt like we were playing in a Golf Magazine calendar picture. 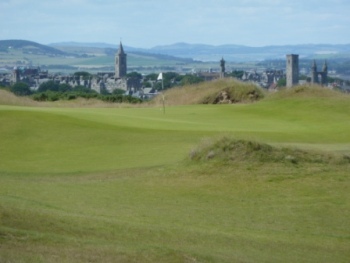 The Castle ruins in the city of St. Andrews and the North Sea always loomed in the background. 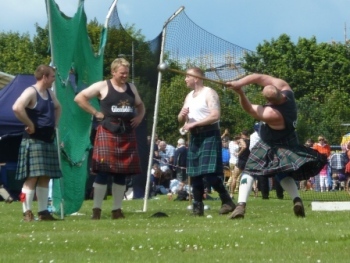 The St. Andrews Highland Games are a big part of the summer fun in Scotland. Men in kilts show off their strength by whirling three times and then hurling 22 pound hammers and 28 pound metal balls on chains to see who could throw them the farthest. An event called "Tossing the Caber" was a crowd favorite. 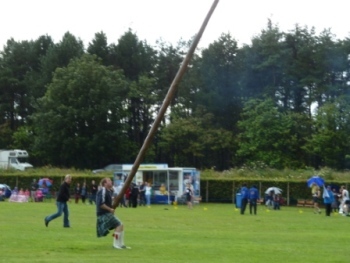 When done correctly, the 200 pound pole was lifted with the heavy end to the top, the man ran forward to heave the caber head over heals in front of him and it landed in a 12 o'clock position pointing away from him. Points are awarded for style, not distance thrown. 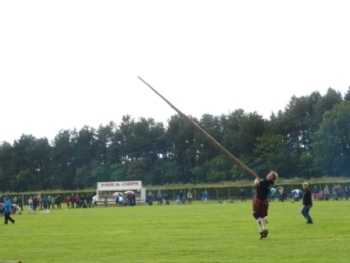 Most of the competitors were not able to acheive the Herculean effort of making the caber rotate head over heals. Some completely lost control and went sideways or backwards (above left) to the peril of the crowd! 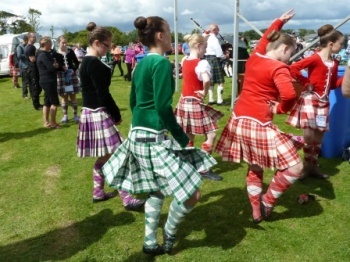 Highland dancers performed in competition with flings and reels to the music of bagpipers. 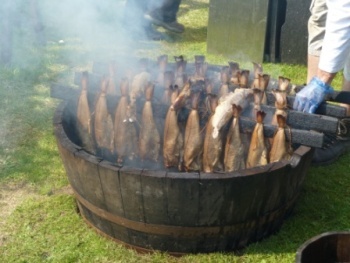 Smoking fish, tents selling local crafts and cashmere, a tug of war and running events added to the festival atmosphere. Ben Hogan won the Grand Slam. 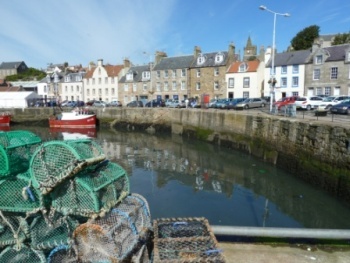 The Kingdom of Fife Coastal Road is dotted with lovely fishing villages like Pittenweem. 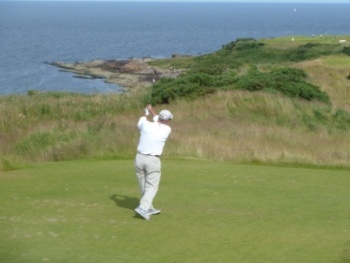 At the end of the Coastal Road is the Crail Golfing Society. 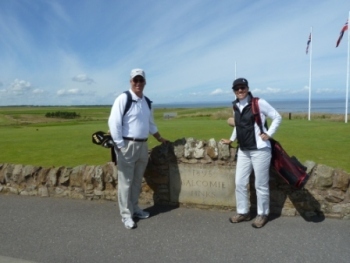 We played at Balcomie Links, an Old Tom Morris designed course, that is the 7th oldest in the world. 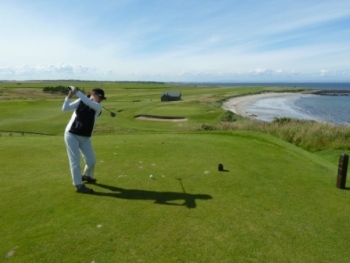 The rough, traps and North Sea coast line offered plenty of challenges. 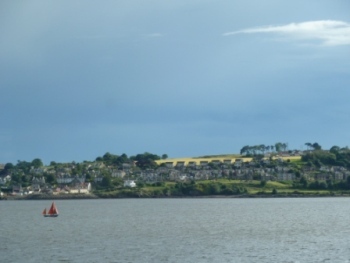 The view from the livingroom and bedroom of our apartment in Broughty Ferry, a suburb of Dundee, was always changing - sailboats, swans, fishermen, kayakers. We loved it! 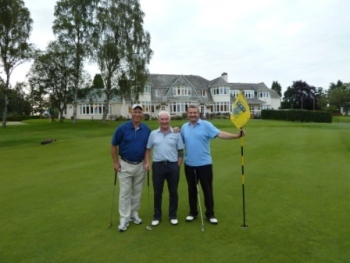 Our landlord, Ewen (center), graciously invited us to play at the Rosemount course at Blairgowrie where he is a member. The Doll's House Restaurant, 3 Church Square, St. Andrew's - Right downtown in a great setting, nice lunch menu, fresh ingredients, reasonable prices - indoor or outdoor seating - get there early to get a table. As we drove north, we entered Pictish lands. 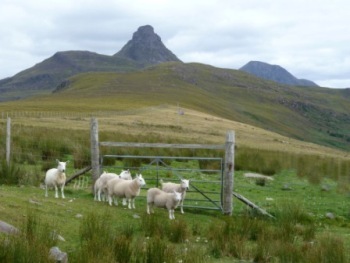 The Picts were the earliest Scottish settlers that recorded their histories in pictures. 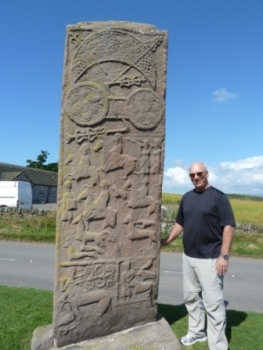 This stone has been sitting outdoors next to the road in Aberlemno since the 600s! Mince & skirle (pronounced skirley) was on the menu in Stonehaven. 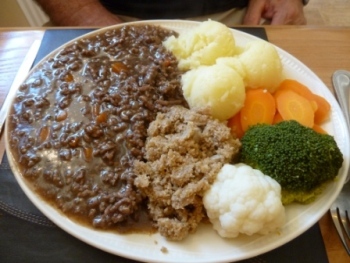 Mince is the hamburger/gravy/carrots combo to the left and skirle is a warm oat-based dressing-like side dish. 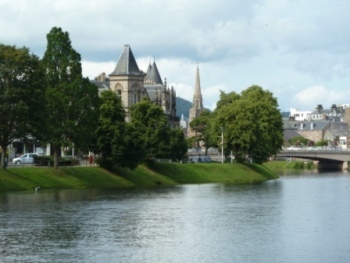 Our apartment in Inverness was next to the River Ness that runs out of Loch Ness, home to the famous monster. 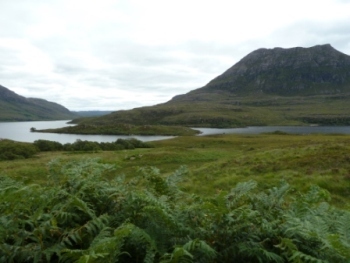 We took a full day drive out to the Western Highlands near Ullapool to see some of the least populated stretches of land in Europe. 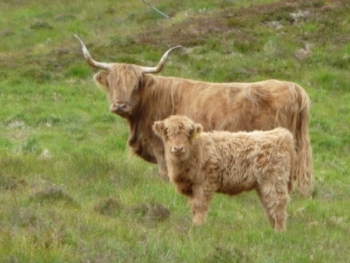 Highland cattle grazed in the moorland that was padded with sphagnum moss and heather, while sheep ran across the single lane roads. Mountain peaks and stone-littered valleys left from glaciers that retreated during the Ice Age were stunning. 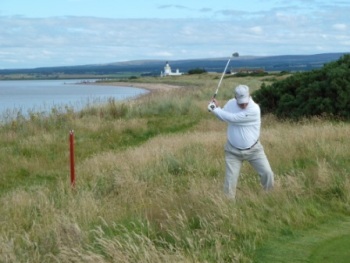 OK, so all our shots weren't in the fairway at the Fortrose & Rosemarkie Golf Club. But when you have views with beaches, a lighthouse, a fortress, dolphins jumping, sea grasses and beautifully manicured fairways; who cares?! 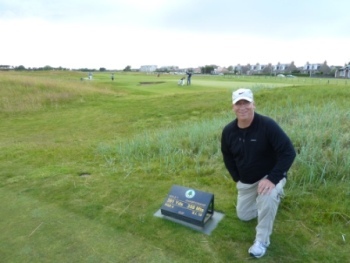 Well, maybe Paul didn't want to be imbedded in the sod of the bunker!